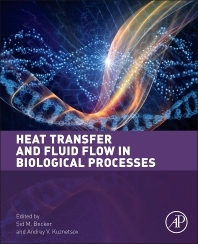 Heat Transfer and Fluid Flow in Biological Processes covers emerging areas in fluid flow and heat transfer relevant to biosystems and medical technology. This book uses an interdisciplinary approach to provide a comprehensive prospective on biofluid mechanics and heat transfer advances and includes reviews of the most recent methods in modeling of flows in biological media, such as CFD. Written by internationally recognized researchers in the field, each chapter provides a strong introductory section that is useful to both readers currently in the field and readers interested in learning more about these areas. Heat Transfer and Fluid Flow in Biological Processes is an indispensable reference for professors, graduate students, professionals, and clinical researchers in the fields of biology, biomedical engineering, chemistry and medicine working on applications of fluid flow, heat transfer, and transport phenomena in biomedical technology. Graduate students, professors, and clinical researchers and professionals whose work relates to fluid flow, heat transfer, and mass transport across the biological, biomedical sciences, and engineering fields. 7.4 Leftward Flow or Flow Recirculation? 7.5 Sensing of the Flow: Mechanosensing or Chemosensing?